You are looking at a 2013 Volkswagen Beetle **FENDER EDITION**. After 13 years as a "New Beetle", the iconic VW bug goes back to being just a Beetle. But it does this in a BIG way, with a clean-sheet redesign that makes it new again. It's the new Beetle, not a "New Beetle". This car is in SUPERB condition, inside and out. It runs and drives fantastic! The special Fender Edition is a mashup of an American guitar icon and a reborn German hatchback for a characterful, limited-time duet. Paying tribute to a classic American guitar brand also means going back in black (the traditional color of rock), while chrome-finished mirror covers and 18-inch alloy wheels cement the 1960s throwback. A ‘Beetle’ badge adorns the rear hatch, ‘Fender’ badges flank each front guard, there’s a ducktail spoiler, and, inside, a cool ‘sunburst’ color is splayed across the dashboard. ‘Sioux’ brown highlights are used on both the leather steering wheel stitching and trim for the leather sports bucket seats, which now also get lumbar support. The Volkswagen Beetle Fender edition gets eight speakers plus a boot-mounted subwoofer – complete with a requisite Fender logo – and a 10-channel amplifier pumping 400 watts into the small cabin. The Fender Edition also sports bi-xenon headlights with LED daytime running lights. 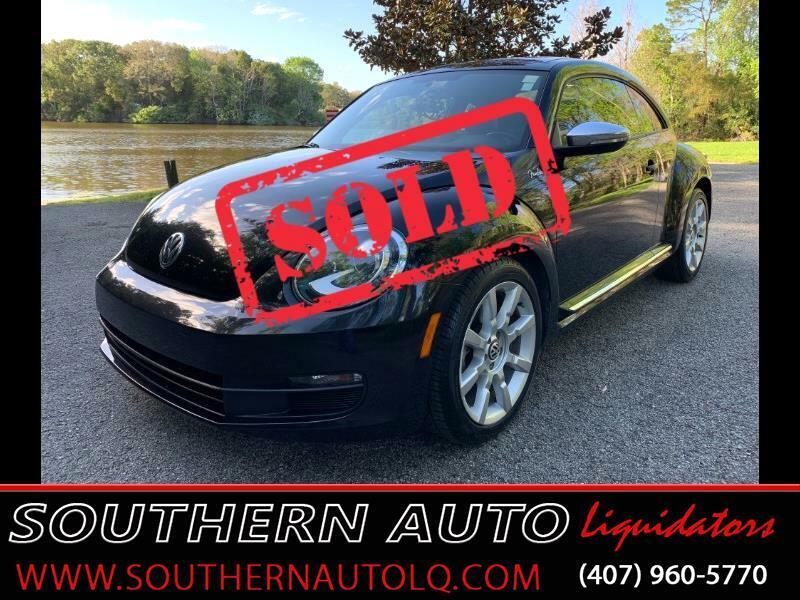 This Beetle comes fully equipped with: power locks and doors, Keyless push-start engine, Ice Cold A/C and front heated seats, steering-wheel controls, and a touch-screen radio with Bluetooth capabilty. The trunk of the 2012 Beetle is spacious at 15.4 cubic feet. With the rear seat folded it's nearly 30 cubic feet, and the high-swinging hatchback enables giant things to fit inside, making the Beetle handy for hauling. The 2.5-liter inline five-cylinder engine, with an iron block and double overhead cams, is carried over from the New Beetle, but the horsepower increases by 20, to 170 hp. Torque increases by seven foot-pounds, to 177 foot-pounds at 4250 rpm. This is not your typical Beetle. It is made to be faster and smoother than all previous Beetles. And, with the addition of Fender, it is also the coolest, best-sounding Beetle on the market. You need to come test-drive this beautiful car, today!